There is one less bottle of The Macallan’s oldest-ever single malt, and we’re claiming partial credit. Only 599 bottles of Macallan 72 remain in the world, after we were invited to taste the precious liquid in Scotland. If it’s not a bottle you’ve heard of before, it will be when it goes on sale this summer. The distillery’s parent company Edrington announced the release of 72 last summer, but it didn’t make much of a splash among record-selling auctions of previous Macallan releases. And Macallan itself was mostly focused on gaining attention for the ribbon cutting of its massive new distillery. More importantly, no one had tasted it. 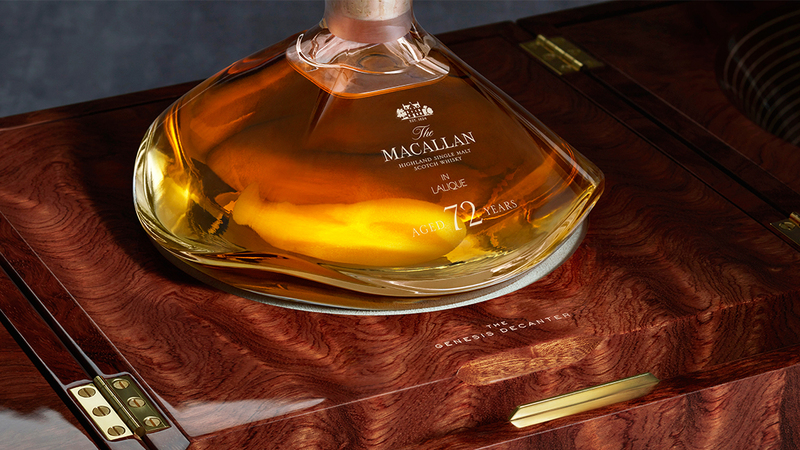 The Macallan 72 “Genesis Decanter,” as it’s also known, is a squat, oddball of a whisky bottle, particularly in comparison with recent Macallan in Lalique releases, which have been elegantly shaped spires seemingly towering over other bottles on the average whisky shelf. The Genesis Decanter is, instead, a nod to Macallan’s new distillery, which opened its doors last summer. It’s an architectural marvel: a building nearly invisible from the entrance (its roof, which blends into the natural curves of the hillside, is overgrown with grass). But from the opposite side, massive towering windows offer a glimpse of the futuristic interiors and three massive arrays of distillation equipment inside. It’s a fitting juxtaposition: the oldest whisky ever released presented in a vessel designed like newest structure on Macallan’s 200-plus acre estate. But the decanter is only the packaging for a one-of-a-kind Scotch single malt. So what is it like to taste it? In one of Macallan’s oldest warehouses, gathered around barrels older than most people in the room, Master Distiller Nick Savage walked us through his initial impressions of the whisky. In flavor alone, this is a unique Macallan dram. On the nose we detected notes of smoked pineapple, raisins, vanilla, and candied ginger. On the palate, the whisky’s seven-plus decades in oak gave it tons of wood spice, but left hints of the peat intact as subtle, low, and vegetal notes of smoke. Over-ripe apples and loads of vanilla carried the whole thing through pleasantly, and the finish wasn’t terribly dry, but leaned fruity and sweet instead. Yes, this whisky is in fact peated. Macallan hasn’t used peat in decades, but these casks were effectively from the era of World War II (filled in 1944) when more modern fuels would have been rationed to the military. But even if this hadn’t been a time capsule in a glass, the age alone is a marvel of an achievement. Whisky simply doesn’t do this often—statistically, a cask should have totally evaporated around 50 years of age, so the exceptions are already defying laws simply by retaining liquid. Macallan used a total of three casks (the youngest of which was 72) for this release of just 600 decanters (156 allotted for the United States). As you might expect, this means the price is going to be stiff. Take a few deep breaths, because the staggering $65,000 price tag is only the price for buying it at retail. The way we’ve been seeing rare and vintage Macallan bottles recently skyrocket in price (and set records), we’d expect this one will grow in value just the same.